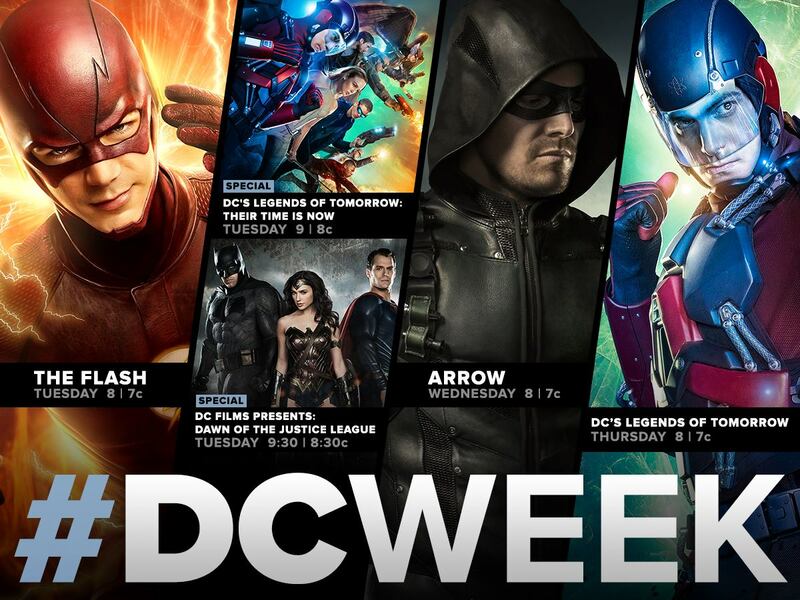 Last week, the CW held "DC Week." Arrow and The Flash returned for the second half of the 2015-16 season, and DC's Legends of Tomorrow premiered. The mid-season finales for Arrow and The Flash left viewers with a lot of questions to contemplate over the two month hiatus. Now, our emerald archer and scarlet speedster have returned to continue fighting crime in their cities as well as try to protect those they hold close. This is Arrow and The Flash. 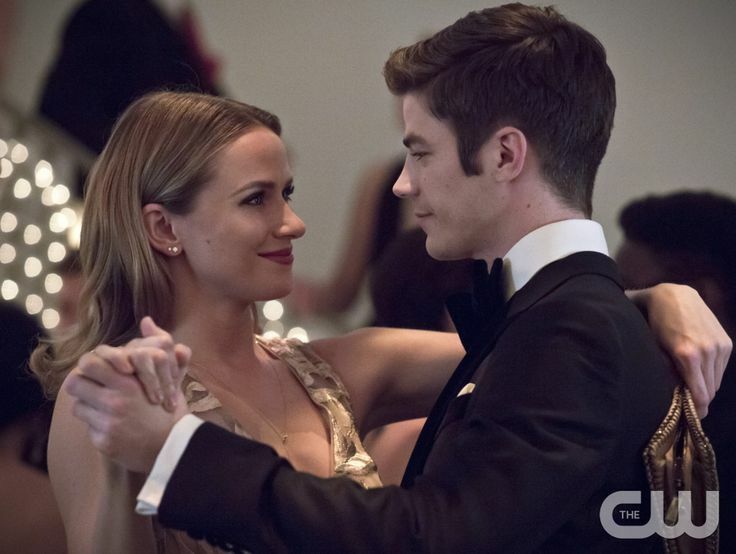 The Flash Episode 10: "Potential Energy"
Barry and Patty are on a date, being their clumsy and dorky selves. (Seriously, these two are too cute for words.) Then, Zoom arrives. He grabs Patty and tosses her off a roof. Barry watches in horror, unable to save her. Then, he wakes up. This dream has been a reoccurring nightmare; his fear of being unable to protect the ones he loves as well as not being fast enough to stop Zoom haunts him. And Patty is starting to take notice. Thus, we get a touching scene between Patty and Iris. Patty asks Iris for advice on what she should do. Iris, of course, gives her the best advice she can offer: talk to Barry. (Can we just pause to appreciate the strong, female friendships in this show? Nobody is letting past feelings get in the way here. I love it.) So Patty does confront Barry, but all he tells her is that the holidays remind him of his mother and her death. (Ouch.) However, this gets Barry thinking. He wonders if he should finally tell Patty the truth about the Flash. Cisco is all for Patty joining the team, but the rest of Team STAR Labs isn't so sure it's a good idea. But he's got other problems to deal with first. A meta-human dubbed "The Turtle" by Cisco has conducted several robberies. His powers? Slowing down time for everybody but himself. Thus, he's been hard to track down. Barry's first encounter with The Turtle doesn't go so well. The meta slows down time to get away, including Barry (though he is able to move a little because of his own abilities). Thus, they have to go to Plan B. Plan B involves Barry on a date with Patty at an art show. (Caitlin and Jay come too, and these four are way too adorable.) His plan was to tell her the truth about him, but things go crazy, which only leads to Barry ditching Patty in order to save the day (or not). Patty, however, gets involved because she spots The Turtle trying to steal a painting. She tries to stop him, but The Turtle reacts. Barry, as The Flash, saves Patty just before she's hit by the falling chandelier. Barry returns to Patty's apartment and finds her missing with bullet shells on the floor. He immediately calls the team together to do something. The team figures out where The Turtle is hiding, and Barry zooms off to save her. After a long, slow-moving struggle (with cool special effects), Barry manages to break through The Turtle's time-slowing blasts to knock the meta out and save Patty. Meanwhile, Joe has his own conflict to deal with: Wally. He shows Wally around Central and even invites him for dinner, but Wally never shows. Instead, Joe finds him street racing in order to earn money to pay for his mother's medical bills. Joe tries to talk to him, but Wally shuts him down. He doesn't want Joe to try to be his father. Heartbroken, Joe lets him go. But Wally returns to get something he left at the West home. Joe apologizes for trying to push the whole "father-son" relationship. They decide to take time and go slow, since they're both new to this whole situation. Then, Eobard Thawne, the Reverse-Flash, shows up in present day Central City. However, he is just as confused as we are on how he got here and why he's there. 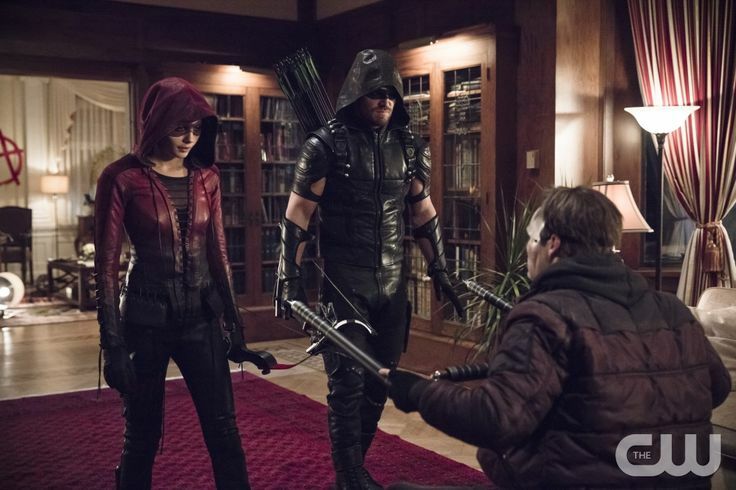 Arrow Episode 10: "Blood Debts"
As Felicity is rushed to the hospital, Oliver takes to the streets as the Green Arrow, determined to track down Darhk no matter what. He continues his quest instead of visiting Felicity in the hospital. Everybody else, however, does visit her, so it's confirmed she's alive even if she's not "well." Diggle helps with the manhunt of Darhk by interrogating his brother. It doesn't go well. Oliver discusses the situation with Captain Lance, hoping he'll give him some tidbit of info to help find Darhk. Lance agrees to reveal Darhk's office location even though it means he'll paint a target on his own back. When Oliver goes to Darhk's office, he finds dead Ghosts and the Anarky mark painted in blood. Lonnie Machin is back. They track him down using the blood. He dons a mask to hide his disfigured face, courtesy of Thea. However, he's not interested in exacting revenge on Thea; instead, he has an odd fixation on her throughout the episode, graciously thanking her for what she did to him. (Okay, that's one way to show a girl love, I guess. Thank her for electrocuting you.) They capture Machin. Oliver interrogates him. But Anarky doesn't have anything to lose, so he doesn't cave. With Oliver left frustrated, the team convinces Oliver to take time to visit Felicity. Upon his arrival at the hospital, Felicity's mother informs him it's likely Felicity will never walk again. However, before he goes to visit Felicity, he learns the police had caught Anarky, courtesy of Laurel. Angry, he frees Machin from the police transport. He places a tracker on him, so he can track down Darhk. But Machin ditches the tracker, leaving Oliver helpless. Diggle talks to Oliver to calm him down, reminding him of what he's doing. Diggle's interrogation of his brother proves fruitful when it gives them a lead on Darhk and Anarky. They follow the lead to a mansion where Machin holds Darhk's family--wife and daughter--hostage. Diggle and Laurel get Darhk's family out while Oliver and Thea chase Machin. Oliver encounters Darhk, which leaves Thea to deal with Machin. Oliver tells Darhk he saved his family, so Darhk shows Oliver mercy... for now. Thea manages to catch Machin, but instead of shooting him, she shows him mercy. This, however, gives him the opportunity to escape. The team recuperates. Diggle shows his brother mercy by playing a game of cards. Thea invites Alex over to give their relationship a fresh start. Oliver visits Felicity, who tells Oliver that Darhk needs to be stopped. Darhk takes his family to a safer location, and it's revealed his seemingly innocent wife is in on the Genesis plans. He promises her a new beginning. In the flashbacks, Oliver is subjected to whipping in punishment for his deception. However, as the grumpy bearded man is whipping him, the tattoos on Oliver's torso (placed there by Constantine) begin to glow. This distracts the leader, which gives Oliver the opportunity to grab a gun and point it at his own head. He threatens to die unless they let the woman go. It works. Both Oliver and Taina live, but they're taken to a prison and locked in a cell. What did you think of the Arrow and The Flash mid-season return? What are your hopes for the rest of the season?